We manufacture this high quality, easy to set-up and operate MP3 player. The perfect industrial digital audio player for kiosk style exhibits and information booths. door bells, display, message repeater, background music, etc. 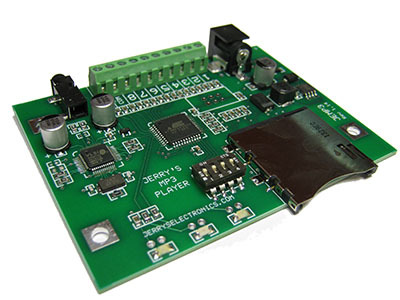 2 - of our 15 Button Input Boards can be used on each MP3 player, for 30 easy direct inputs! Easy to hook up and operate, very fast button response time <20ms! Can drive headphones directly or add an external amplifier and speakers. Playback at near CD quality at up to 320kbps rate. Get 16 hours of playback using a 1GB SD memory card at near CD quality output. Can be customized to your application - email with requirements. Plays up to 31 MP3 files, 1 MP3 file can play as a repeating attract loop when no buttons are being pressed. 30 MP3 files respond to button inputs and play immediately when their associated buttons are pressed. DIP switches on the board allow for easy configuration changes on how your MP3 files are played. select interruptible or non-interruptible operation. add previous, next, random and stop buttons. Sound quality, small footprint (2.65" x 3.54"), reliability, very efficient design and no ventilation required (draws 18ma idle and 37ma playing @ 12V) make this MP3 player the perfect choice for your next project. - Minimum 2G SD memory card. - 100-130 Vac 50-60 Hz ac adapter, level V.
- AC adapter power supply CEC compliant. - 4 PCB standoffs for easy mounting. Qty 1 - 3 $185.00 each. Qty 4 - 9 $170.00 each. - Same audio player board as above. 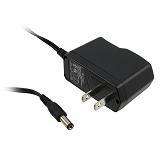 - 100-240 Vac 50-60 Hz ac adapter with international plug. Qty 1 - 3 $190.00 each. For powering 2 of our MP3 players from a single power source. Single female 5.5 x 2.1mm to two male 5.5 x 2.1mm. Replacement switching power supply for MP3 players. 12 Volt DC @ 0.5 Amp, level V efficient. One power supply can power 8 of our MP3 players. Standard DC plug - Male 5.5 x 2.1mm. For stack mounting 2 or more of our MP3 players. Zinc plated brass, 6-32 thread size. Interfaces up to 15 pushbutton switches. Hooks up directly to our MP3 player. 2 boards can be used per player. Board has 4 mounting holes. Optional solder or screw terminal connections.